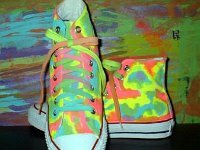 Photo gallery of high top chucks with uppers that have been customed painted with pictures and designs or tie-dyed. 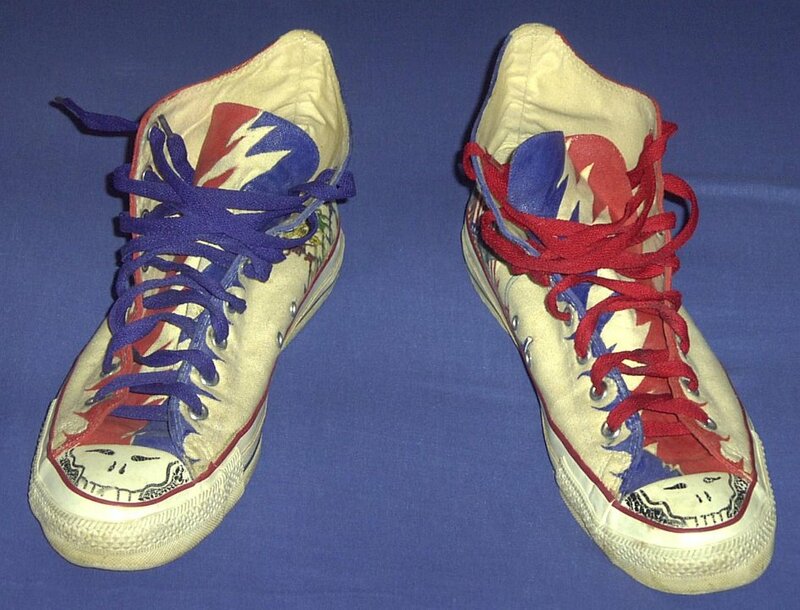 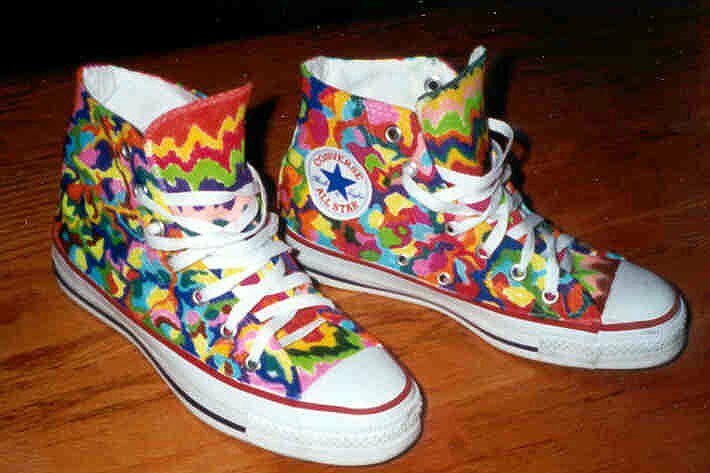 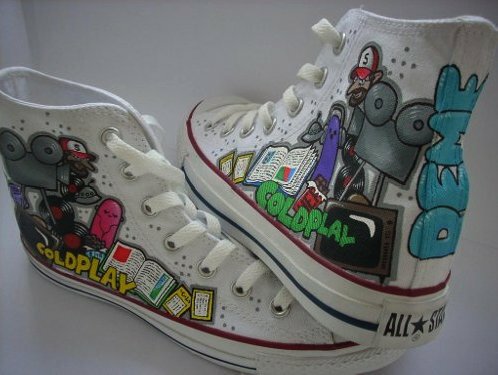 1 Hand Painted or Tie-Dyed High Top Chucks Cold Play design painted on optical white high tops. 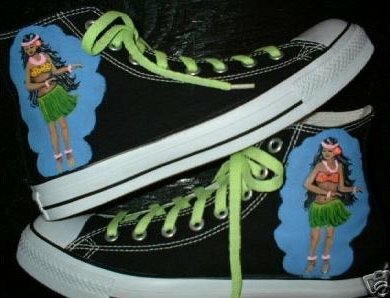 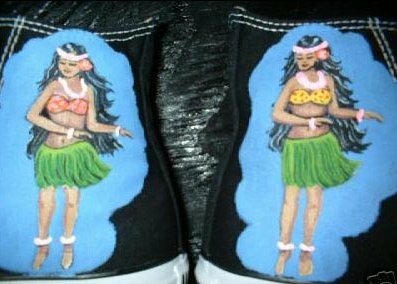 2 Hand Painted or Tie-Dyed High Top Chucks Hula dancers painted on black high tops, shot 1. 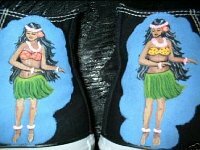 3 Hand Painted or Tie-Dyed High Top Chucks Hula dancers painted on black high tops, shot 2. 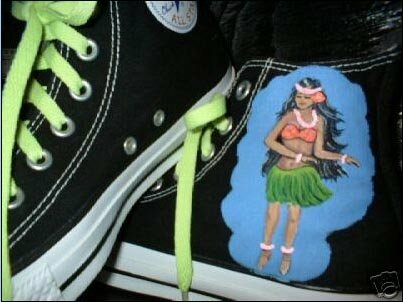 4 Hand Painted or Tie-Dyed High Top Chucks Hula dancers painted on black high tops, shot 3. 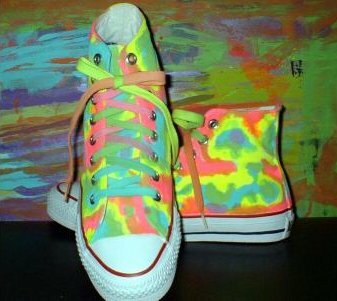 5 Hand Painted or Tie-Dyed High Top Chucks Custom painted white high tops, side views. 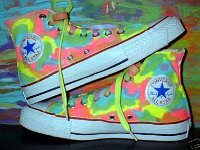 6 Hand Painted or Tie-Dyed High Top Chucks Custom painted white high tops, rear view. 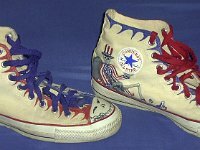 7 Hand Painted or Tie-Dyed High Top Chucks Custom painted white high top, inside patch view. 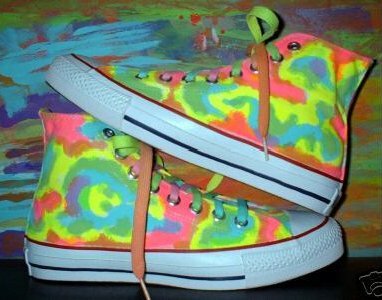 8 Hand Painted or Tie-Dyed High Top Chucks Custom painted white high tops, angled side and top views. 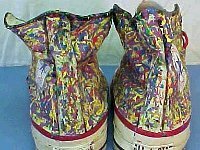 9 Hand Painted or Tie-Dyed High Top Chucks Abstract painted high tops, shot 1. 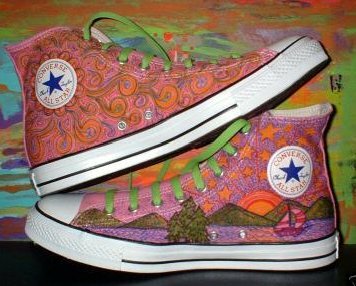 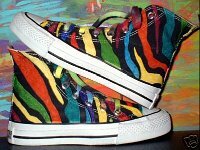 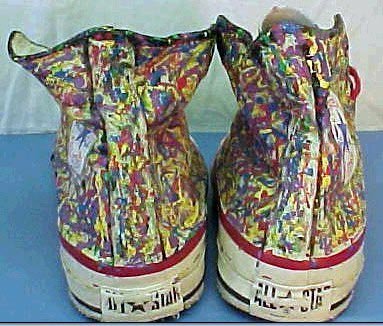 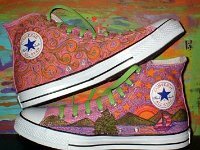 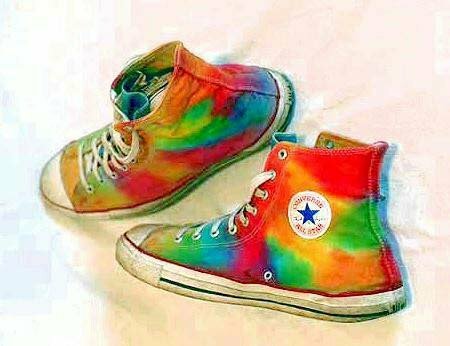 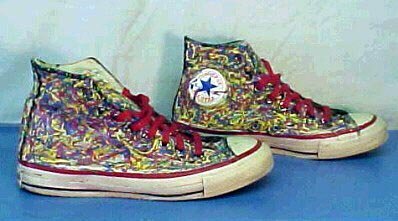 10 Hand Painted or Tie-Dyed High Top Chucks Abstract painted high tops, shot 2. 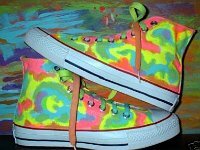 11 Hand Painted or Tie-Dyed High Top Chucks Abstract painted high tops, shot 3. 12 Hand Painted or Tie-Dyed High Top Chucks Custom painted stripe design, shot 1. 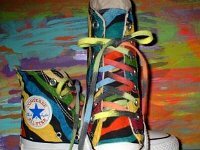 13 Hand Painted or Tie-Dyed High Top Chucks Custom painted stripe design, shot 2. 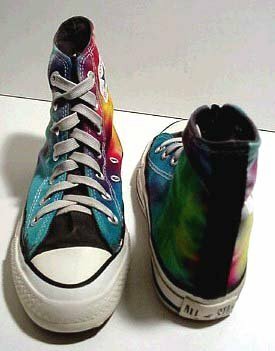 14 Hand Painted or Tie-Dyed High Top Chucks Custom painted stripe design, shot 3. 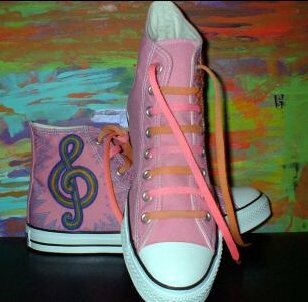 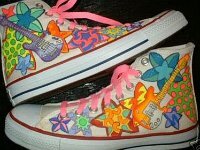 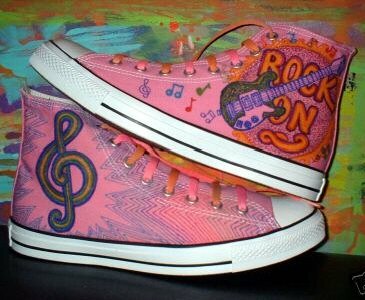 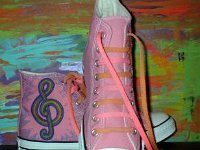 15 Hand Painted or Tie-Dyed High Top Chucks Music themed painted chucks, shot 1. 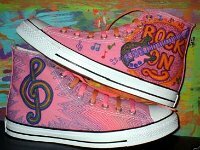 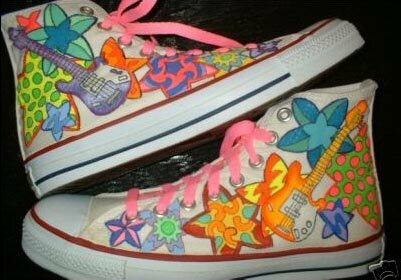 16 Hand Painted or Tie-Dyed High Top Chucks Music themed painted chucks, shot 2. 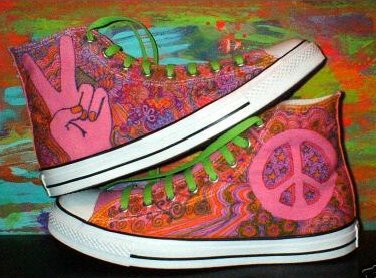 17 Hand Painted or Tie-Dyed High Top Chucks Peace sign painted chucks, shot 1. 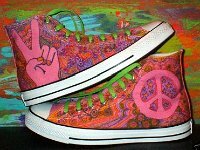 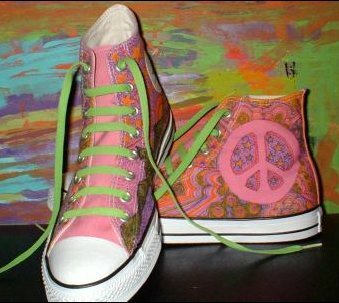 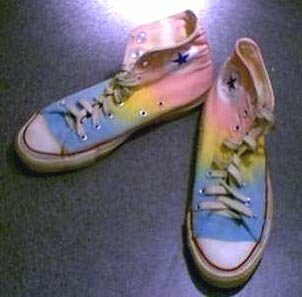 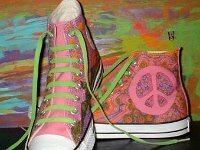 18 Hand Painted or Tie-Dyed High Top Chucks Peace sign painted chucks, shot 2. 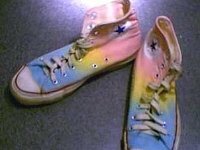 19 Hand Painted or Tie-Dyed High Top Chucks Peace sign painted chucks, shot 3. 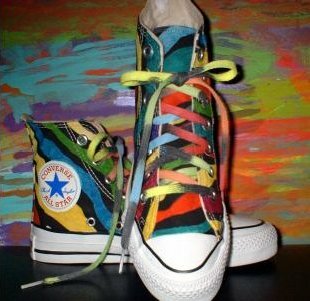 20 Hand Painted or Tie-Dyed High Top Chucks Custom painted chucks, front view. 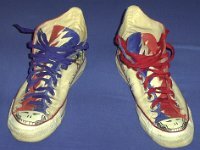 21 Hand Painted or Tie-Dyed High Top Chucks Custom painted chucks, right side view. 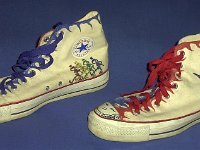 22 Hand Painted or Tie-Dyed High Top Chucks Custom painted chucks, left side view. 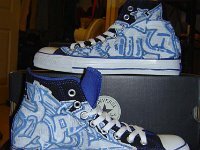 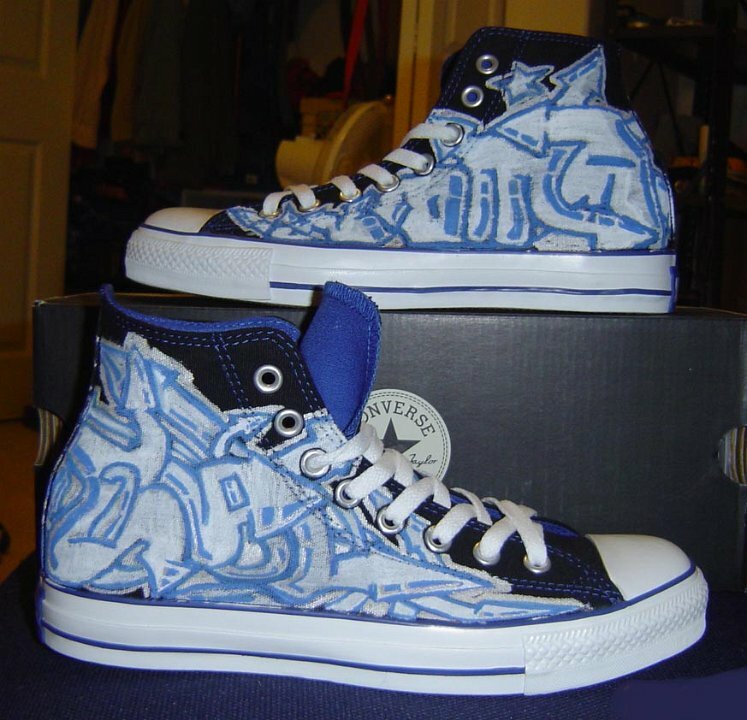 23 Hand Painted or Tie-Dyed High Top Chucks Side views of custom painted black and royal blue foldover high tops. 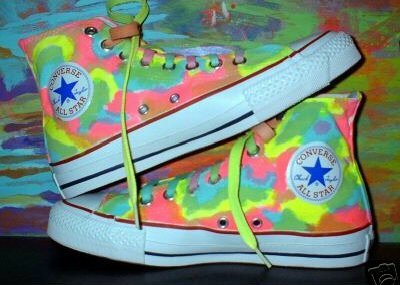 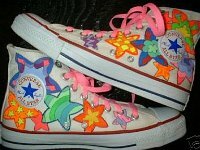 24 Hand Painted or Tie-Dyed High Top Chucks Pastel rainbow pattern high tops, top view. 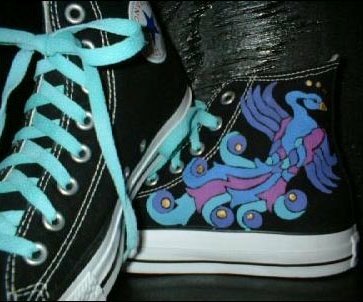 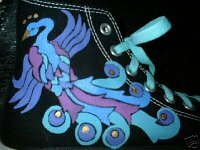 25 Hand Painted or Tie-Dyed High Top Chucks Phoenix on black high tops, view 1. 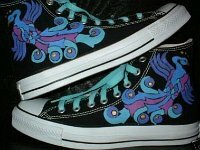 26 Hand Painted or Tie-Dyed High Top Chucks Phoenix on black high tops, view 2. 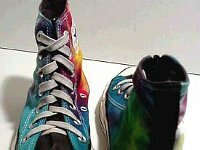 27 Hand Painted or Tie-Dyed High Top Chucks Phoenix on black high tops, view 3. 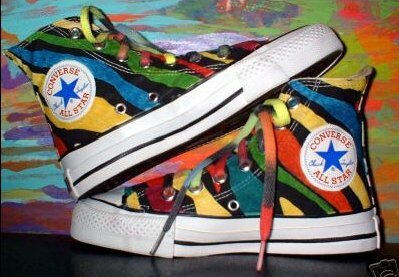 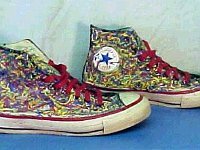 28 Hand Painted or Tie-Dyed High Top Chucks Rock star pattern high tops, view 1. 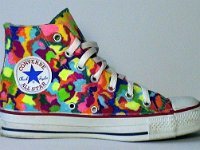 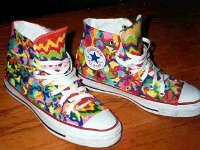 29 Hand Painted or Tie-Dyed High Top Chucks Rock star pattern high tops, view 2. 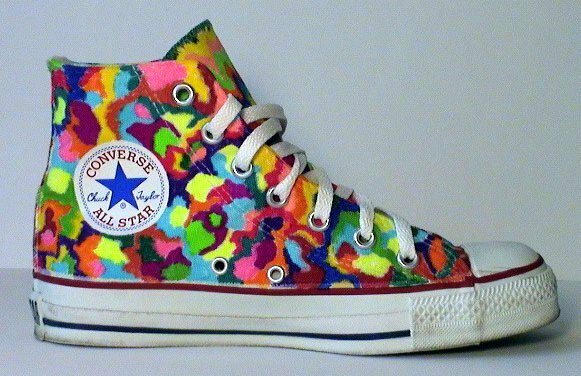 30 Hand Painted or Tie-Dyed High Top Chucks Rock star pattern high tops, view 3. 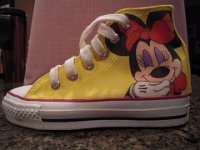 31 Hand Painted or Tie-Dyed High Top Chucks Minnie Mouse painted on kids optical white high top chucks. 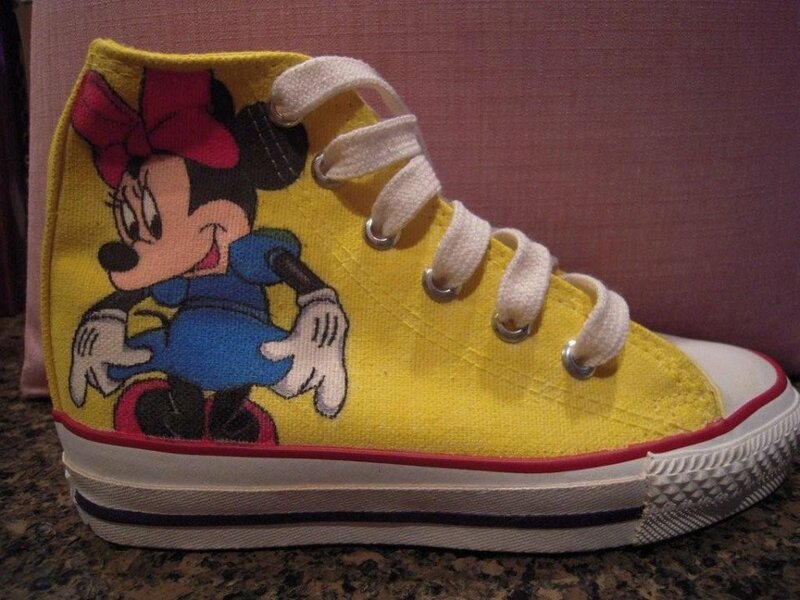 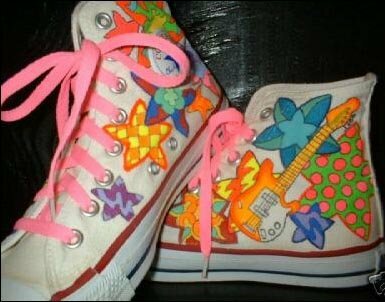 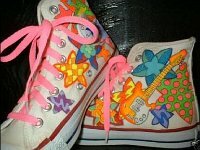 32 Hand Painted or Tie-Dyed High Top Chucks Minnie Mouse painted on kids optical white high top chucks. 33 Hand Painted or Tie-Dyed High Top Chucks Worn tie dyed optical white high tops, angled side views. 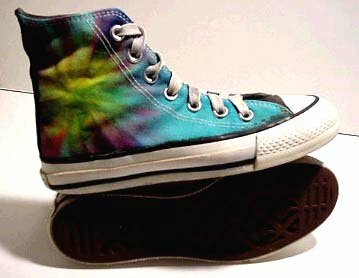 34 Hand Painted or Tie-Dyed High Top Chucks Tie dyed black high tops, angled side views. 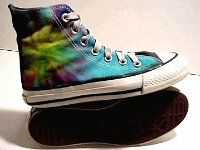 35 Hand Painted or Tie-Dyed High Top Chucks Tie dyed black high tops, front and rear views. 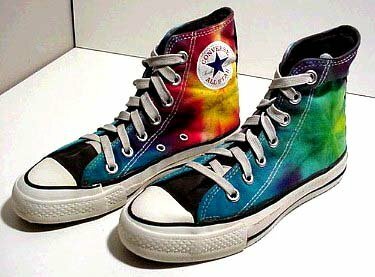 36 Hand Painted or Tie-Dyed High Top Chucks Tie dyed black high tops, outside and sole views.